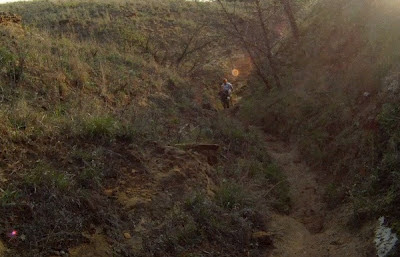 I really didn’t know what to expect from an ultramarathon in Kansas. Admittedly, I know very little about the state other than the grainy images I’ve seen in “The Wizard of Oz.” My buddy, Jeremy Ebel, and I took the 6 hour drive from Boulder to Ellsworth Kansas to see what this event was all about. The 2012 race was the 14th annual “Rockin’ K 50″. RD Phil Sheridan and his wife, Stacy, have polished this event for over a decade and created a real special adventure for all the runners. Phil and Stacy take great pride in their event and it clearly shows. As I sit her in my hotel room post-race, I am so happy I made the trip out here to run this gem of a race! The pride and professionalism is apparent with fresh food at the pre-race dinner and well-marked course. 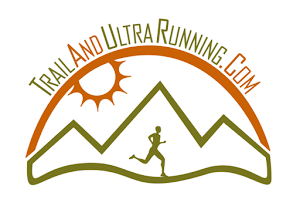 The local running community and members of the ”Kansas Ultrarunner’s Society” are there to help each and every runner get through the race intact. The aid stations are organized and full of experienced volunteers. Sadly, this year will be the last year for Phil and Stacy as race directors. Phil told me he will be passing the responsibility of the race to new Race Directors Stuart Ray and Elden Galano in 2013. At the race brief, Phil provided an entertaining speech about things we, as runners, should not do. The list was quite long and I quietly made a list of things I should do, like “listen to Phil”. He listed the race challenges, including ticks, snakes, wind, water crossings, thunderstorms, heat, washed out trails, and the likelihood that we would need to “use our hands” to scale a section of trail that is not used by anyone except those in the race. I sat in the back of the room debating whether lyme disease was worth my continued participation. It was obvious that runners in past years had made everyone of these mistakes! At the start, we took off and began our adventure together. Marathoners and 50 milers ran as one large group. We followed the course markings and enjoyed calm wind, clouds, and a fair bit of humidity. I weaved my way up near the top 10 runners and settled into my pace, which was dictated by my heart rate monitor. The trail was tight single track with soft footing and plentiful grass. The uncharacteristic greenery, according to Phil, was the result of a dry winter and early spring. Within the first few miles, the terrain changed significantly to a rocky canyon and sandy double track. We hit some switchbacks and came face to face with the first water crossing. It was about mid-thigh deep, with cold murky water. This was the first of approximately 15 water crossings of the day. Shoes sloshing, I climbed up and out of the canyon, challenged by soft red sand and overgrown thorn bushes. Failing to heed the yoda-like warnings of RD Phil, I started down the wrong path. Yes, I saw course markings…but I disregarded the color until I started to see a patter emerge. After about 1 ½ miles of digging my hole deeper, I stopped and informed myself that I was, indeed, running the wrong direction. The course markings were clearly “in bound” and not “out bound”. I didn’t see any other runners. Damn! 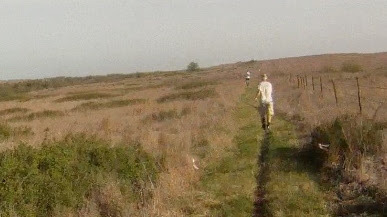 I raced back to find the first out-bound flagging, which was at that unmanned water station. This added 2 miles to my run and set me back about 20 minutes. Starting down the correct path, I found myself behind 20 or more runners. This was devastating to me because it clearly displayed the evidence of my error. My heart rate soared and I couldn’t decide whether to run hard and “erase” what had happened or just jog along as if I’d meant to do it. Being a competitive guy, I tapped into my zone 3 and cranked along the left side of runners as my heart rate increased into areas I didn’t like to see. My frustration continued over about 2 hours while the increased effort depleted my reserves and my body demanded I slow down a little bit. I came into the “marathon” finish of the first loop with 28.3 miles on my Garmin. I was still feeling frustrated and upset with myself. This continued as I ran out of the aid station for my second loop. I had forgotten to enjoy the day and I was being really hard on myself. But, at mile 35 something happened that changed all that. I was running through this single track, alone, with trees in a canopy above my head. It was a beautiful marsh area with deep green grass and life everywhere. 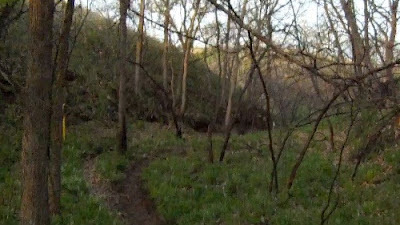 I was cursing a little bit, still angry at myself for going off trail. Then, without warning, I felt a pain in the right side of my chest. I slowed down to evaluate the problem. It was a pinching feeling, and I dismissed it almost as soon as it disappeared. Was it my heart? Perhaps it was indigestion? Not really sure…but it quickly disappeared. Then I thought about Micah. This past week, Micah True, aka “Caballo Blanco”, died while running in New Mexico. His death was unexpected and deeply saddened the running community. The pain my chest at that moment was gone, but my thoughts remained on Caballo Blanco. I became sad…very sad. This man, a compassionate ultrarunner, embodied the greatest of what our sport has to offer. Then he died suddenly while running. He was doing what he loved. And he was doing what I was doing at that very moment! Who I am I feel upset? Who am I to be frustrated!? I am so selfish. I climbed out of the marsh area and found myself at the top of a grass hill where I could see for miles. The wind was strong, approximately 30 mph. The grass and trees blew…The sun shined and my run continued. I realized I had been wrong about my emotions for several hours. It hit me hard. The place I was in…the moment. Runner’s high baby. The wind gusted, the sun shined. Below my feet, the earth stood strong. And between the sky and the earth, in that place they came together was me…running with happy tears of joy. I fueled my mind and body on these powerful feelings for the rest of my race. I eventually climbed into a position where I was told I was running in 3rd place. Jeremy Morris, the eventual winner, wasn’t fading. Right behind him, Todd Nott plugged consistent miles and wouldn’t let me sneak up behind him. So, it finished that way. I was happy. More important to me was the experience of finding the strength to redirect my feelings of sadness to pure happiness. I’m sure Caballo, himself, had a little bit to do with that. My good friend and training partner, Jeremy Ebel, carried a goPro camera during one of the loops. His footage, along with some I captured before and after the race will give you a true sense of the beauty of this incredible race. I highly recommend you make the trip to Kansas for the Rockin’ K 50 mile, it is a race that will find its way into your heart. This is our video about our trip to Kansas for the 2012 “Rockin’ K 50 mi” ultramarathon. Run long and prosper! Awesome stuff Jerry. Sounds like a successful day. Congrats! !